This can be fed as a chopped up mix all in one go, or you can alternate what you feed across different nights of the week. If you only have a small group of rats a great way of doing this is to get a load of veg and chop up into single freezer bags with a nice balanced mix in. Aim for each freezer bag to contain 1 potion and you can feed straight from the freezer, breaking up the mix a little before putting in the cage. This helps preserve the vitamins and minerals as well as keeping things fresh. ​Adzuki/Aduki/Azuki beans (legume) – Small reddish brown bean, can be fed raw, tinned , boiled, sprouted. Sometimes called Red bean. A good source of minerals. Can be sold sweetened which should be avoided. Apple (fruit) – A widely available fruit, the pips can be removed if you are concerned as they contain low levels of cyanide, however in reality a rat would need to eat many seeds to be affected by it. High in vitamin C and fibre whilst being low in calories. They are also full of moisture so are a good source for travelling / shows. Can be fed raw, cooked and dried, though avoid preserved or sweetened dried apple. Apricots (fruit) – A fruit high in vitamin C and beta carotenes as well as antioxidants. They can offer benefits to health and help reduce inflammation. Avoid dried apricots as these are often treated with sulphur containing compounds to preserve them. You may wish to remove the stone as, like apples, this contains small amounts of cyanide, but again too low levels for a single apricot to realistically harm a rat. However the stone does contain relatively high levels of D-Limonene, a substance that can become harmful to male rats so should be removed before feeding to them. Asparagus (other veg) - This is a green stalk shaped plant commonly sold as a young sprout though older parts of the plant are also safe to eat. It can be fed raw or cooked. It is high in Vitamin K and contains anti-carcinogenic compounds which may help reduce the risk of certain types of cancer. Aubergine / Eggplant (other veg) – This can be fed cooked or raw, however it is quite bitter when raw so may be unpalatable. It has potential weight loss benefits as well as lowering cholesterol but should not be fed too often as it also has the highest nicotine concentration of any edible plant. 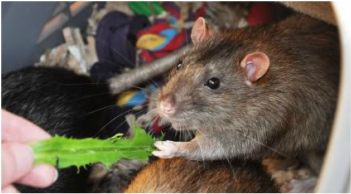 ​Basil (leafy green – herb) – Both the leaves and the full plant (complete with soil) can be given to the rats. Bamboo shoots (other veg) – Often sold for stir-fry’s, these are pale creamy looking strips. Can be fed straight from the tin or cooked. Banana (fruit) – A commonly available fruit rich in potassium and easily digestible calories. This makes it an especially good food for rats needing to gain weight. This can also be fed safely to old rats in moderation as whilst it has high potassium (which puts strain on the kidneys) many rats with kidney degeneration are actually deficient in potassium so a small amount to top them up is useful. It can be fed raw, cooked, mushed up or dried, though avoid sweetened dried banana. Mushed banana is particularly useful for disguising some medication, especially banana flavoured septrin. Bean sprouts (legume) – These are rich in nutrients and an excellent meal especially for young and growing rats. You can make your own from all varieties of beans and peas that can be eaten without cooking. Those sold as beansprouts in the supermarket are often mung beans. Feed raw ideally though they can be cooked. Beetroot (colourful veg) – These are widely classed as a superfood, rich in vitamin C and other beneficial vitamins as well as antioxidants. You can feed the leaves as well as the vegetable (root) of the beetroot, raw or cooked. Just be warned the natural pink dye in the food can dye your rats and it may look like there’s been a massacre. Don’t feed too often as whilst they are full of good things, they are also high in sugar so should be limited in quantity and frequency. Bilberry (berry) – Bilberries are full of vitamin C and antioxidants so great for long term health and wellbeing. These are also lower sugar content than most fruits so are better for their teeth and waistline. The can be fed raw or cooked though can be a bit bitter raw. Just look out for the skin and staining that can be left behind as it may make you think there has been murder. Blackberry (berry) – Blackberries are full of vitamin C and antioxidants so great for long term health and wellbeing. These are also lower sugar content than most fruits so are better for their teeth and waistline. The can be fed raw or cooked. Just look out for the skin and staining that can be left behind as it may make you think there has been murder. Blackcurrant (berry) – Blackcurrants are full of vitamin C and antioxidants so great for long term health and wellbeing. These are also lower sugar content than most fruits so are better for their teeth and waistline. The can be fed raw or cooked though some rats find raw a little bitter. Just look out for the skin and staining that can be left behind as it may make you think there has been murder. Blueberry (berry) – Blueberries are full of vitamin C and antioxidants so great for long term health and wellbeing. These are also lower sugar content than most fruits so are better for their teeth and waistline. The can be fed raw or cooked. Just look out for the skin and staining that can be left behind as it may make you think there has been murder. Bok choy / Pak choi (leafy green) – This is one of the better leafy greens, having similar properties to Kale and Dandelion but sometimes being preferred as it has a less bitter taste. It has good amounts of copper, calcium and a good calcium/phosphorus balance so is especially useful for growing youngsters. Broad beans (legume) – These can be fed straight from the can or boiled but should not be fed dried. They are fairly carbohydrate dense so good for bulking up poorly rats but can be a little dry textured if overcooked so may need a “sauce” or water added to avoid choking. Broccoli (other veg) – These can be fed raw or cooked, including the leaves and stem (and purple sprouting variants), they have good levels of antioxidants and there have been studies showing that they help prevent cancer. Brussels sprouts (other veg) – These can be fed raw (despite internet myths that may say otherwise), the leaves and stalks are also fine. Butternut squash (other veg) – This is a good source of carbohydrates and can be fed raw or cooked but it is generally preferred cooked. As it is rich in carbohydrates it is best kept for occasional meals or for when you need to bulk a rat up. ​Cannellini beans (legume) – These can be fed canned or boiled but should be avoided dried due to antinutrients. Carrots (colourful veg) – Carrots are high in vitamin C, especially carotenoids which makes them a very useful veg to feed. They can be fed raw or cooked, grated seem especially popular. Don’t suddenly increase the amount of carrot you feed as it seems to be particularly linked to causing stomach upsets when the amount is increased suddenly. Celeriac (other veg) – This is a good source of starchy carbohydrates and can be fed raw or cooked but it is generally preferred cooked. As it is rich in carbohydrates it is best kept for occasional meals or for when you need to bulk a rat up. Cherries (berry) – Cherries are high in vitamin C and antioxidants so great for long term health and wellbeing. These are not as low in sugar as most berries so should be limited to occasional treats. The can be fed raw or cooked and are very palatable to most rats if feeding them you should either remove the stones before offering them, or monitor the rats and remove the stones once they have eaten the flesh as the stones do contain arsenic though at relatively low levels. Chick Peas (legume) – These can be fed roasted sprouted, canned or boiled but should generally be avoided dried due to the anti nutrients they contain, one or two now and then wont cause issues but fed too often it can build up. Chickpeas are high in protein and copper and make a useful meal for youngsters. Chicory (leafy veg) – Chicory is a leafy herb which can be fed raw but is often more palatable cooked. It can increase calcium absorption and bone marrow density so is particularly useful in growing rats but should be fed in moderation as too much can cause issues. Clementine (fruit – citrus) – As with all citrus fruits this is a good source of vitamin C but contains high levels of De Limoene (especially in the skin and pith) so should be only fed to does. It may reduce the chances of certain cancers but is high in sugar so should be limited to occasional treats. Clover (leafy green) - this is a useful rat veg suitable to be fed daily (though difficult to get hold of in large amounts. It is full of iron, calcium and vitamin K.
Coconut (other veg) – Whilst coconut is not strictly a veg it is often sold in the same section, and makes a nice addition to a bowl of mixed veg. It’s full of really nice oils which are great for coat and skin health. It can be fed raw, dried (in flakes or ground) and even straight from froze (in small pieces. It’s high in fat so don’t over feed but a small amount is great. A whole coconut in the shell can be fed if your drill a few holes in to allow access and drain the water from the inside, left too long (approx. 1 week) it will start to ferment and should be removed. The milk / cream is very useful for hydrating and bulking up foods for underweight or sick rats. Collard greens (leafy green) – This is a useful alternative to dandelion and kale and is a good rat veg suitable to be fed daily. It is full of iron, calcium and vitamin K.
Coriander (leafy green – herb) – This is a useful leafy veg full of herby flavours. Some rats dislike it for its bitter flavour. Courgette (Zucchini) (other veg) – Good to feed cooked or raw, often especially appreciated grated. Cranberries (berry) – These are high in vitamin C and antioxidants so great for long term health and wellbeing. These are not as low in sugar as most berries so should be limited to occasional treats. The can be fed raw or cooked and are very palatable to most rats if feeding them you should either remove the stones before offering them, or monitor the rats and remove the stones once they have eaten the flesh as the stones do contain arsenic though at relatively low levels. Cress (other veg) – Particularly fun to grow your own in a digging box or buy complete with soil from the supermarket. The rats will have great fun tearing it apart but it is messy. Cucumber (other veg) – This is full of moisture and very palatable for rats which makes it a great moisture source for shows or travelling. ​Damson (fruit) - These are high in vitamin C and antioxidants so great for long term health and wellbeing. These are not as low in sugar as most berries so should be limited to occasional treats. The can be fed raw or cooked and are very palatable to most rats if feeding them you should either remove the stones before offering them, or monitor the rats and remove the stones once they have eaten the flesh as the stones do contain arsenic though at relatively low levels. Dandelion leaves (leafy green) – Dandelion leaves have a really good ratio of calcium to phosphorus and are a very good rat veg suitable to be fed daily. They are full of iron, calcium and vitamin K and are definitely a rat super food. Dates (fruit) – Dates are dried figs and often sold in a syrup, as such very high in sugar so should be fed only rarely. Eggplant / Aubergine (other veg) – This can be fed cooked or raw, however it is quite bitter when raw so may be unpalatable. It has potential weight loss benefits as well as lowering cholesterol but should not be fed too often as it also has the highest nicotine concentration of any edible plant. Endive (other veg) – Endive is a form of chicory and is a leafy herb which can be fed raw but is often more palatable cooked. It can increase calcium absorption and bone marrow density so is particularly useful in growing rats but should be fed in moderation as too much can cause issues. ​Fennel (leafy veg - herb) – the bulb and leaves can be eaten raw or cooked, the seeds are often enjoyed as part of a dry mix. It has an interesting flavour which most rats enjoy but the bulb is high in water and fibre so should fed in moderation. Figs (fruit) – figs are very high in sugar so should be fed in moderation as an occasional treat. ​Haricot beans (legume) – These can be fed canned or boiled but should be avoided dried due to antinutrients. ​Jerusalem artichoke (other veg) – This is a high carbohydrate (though low starch) vegitable with a good amount of protein, though they are relatively high in sugar once stored for any length of time. These are particularly useful as a carbohydrate and fiber source with diabetic rats. They can be fed raw and cooked but should be washed before feeding straight from the ground. ​Kale (curly/romaine/blue etc) (leafy green) – Kale has a really good ratio of calcium to phosphorus and are a very good rat veg suitable to be fed daily. It is full of iron, calcium and vitamin K and are definitely a rat super food. Kidney beans (legume) - These can be fed canned or soaked and boiled but should be avoided dried due to antinutrients which are particularly toxic in dried kidney beans. Make sure to rinse canned beans before feeding. Kumquat (fruit – citrus) – As with all citrus fruits this is a good source of vitamin C but contains high levels of De limonene (especially in the skin and pith) so should be only fed to does. It may reduce the chances of certain cancers but is high in sugar so should be limited to occasional treats. ​Leek (other veg) – This is a member of the onion family and should be fed in moderation as too much raw can upset the stomach, however it has good health benefits being good for the immune system and heart. It is often more palatable cooked than raw. Lemon (fruit – citrus) – As with all citrus fruits this is a good source of vitamin C but contains high levels of De limonene (especially in the skin and pith) so should be only fed to does. It may reduce the chances of certain cancers but is high in sugar so should be limited to occasional treats. Lentils (legume) – These are a member of the pea family and all varieties can be fed raw, sprouted, cooked and even dried (though it’s harder for them to get nutrients from dried formats). They are a good source of protein especially when sprouted so great for the young. Lettuce (other veg) – This is not very nutritious and has a high water content so should be kept to only small amounts infrequently as it can cause stomach upsets when fed too often. Lime (fruit – citrus) – As with all citrus fruits this is a good source of vitamin C but contains high levels of De limonene (especially in the skin and pith) so should be only fed to does. It may reduce the chances of certain cancers but is high in sugar so should be limited to occasional treats. Loganberry (berry) – These are high in vitamin C and antioxidants so great for long term health and wellbeing. They should be fed cooked as most rats do not appreciate how bitter they are raw and this can cause stomach upsets. Mandarin (fruit – citrus) – As with all citrus fruits this is a good source of vitamin C but contains high levels of De limonene (especially in the skin and pith) so should be only fed to does. It may reduce the chances of certain cancers but is high in sugar so should be limited to occasional treats. Mango (fruit) – These should be limited to girls only due to the high levels of de-limonene they contain (which is generally good for girls). These are relatively high in sugar so should be limited to occasional treats. The can be fed raw or cooked and are very palatable to most rats if feeding them you should either remove the stones before offering them, or monitor the rats and remove the stones once they have eaten the flesh as the stones do contain arsenic though at relatively low levels. Marrow (other veg) – It is high in fibre which makes it particularly useful when a rat has diahorria such as when on antibiotics. It can be fed raw and cooked though some rats dislike it raw. Mint (leafy green – herb) – This is a useful leafy veg full of herby flavours. Some rats insist on grooming this into their fur, it is thought this is to act as an ant parasitic. Rats fed on mint generally have a lovely minty smell. It can be fed raw and even dried. Mulberry (berry) – These are high in vitamin C and antioxidants so great for long term health and wellbeing. They can be fed raw or cooked and are very palatable to most rats. As with most berry bushes the leaves can be eaten too. Mung beans (legume) – These can be fed sprouted, raw, canned or boiled, the sprouted version are often sold as bean sprouts in supermarkets and are generally much appreciated by rats. Mushrooms (other veg) – can be fed raw, dried and cooked, dried mushrooms are particularly good for copper content, some rats dislike these but many go nuts. Stick to only mushroom types that are edible to humans such as those sold in supermarkets as many wild mushrooms/fungi are poisonous. ​Nectarines (fruit) – These are popular fruits with rats and can be fed raw or cooked though they are relatively high in sugar so should be limited to occasional treats. If feeding them you should either remove the stones before offering them, or monitor the rats and remove the stones once they have eaten the flesh as the stones do contain arsenic though at relatively low levels. ​Okra (other veg) – Also known as ladies fingers these are actually edible seed pods. It is known for its high fiber, vitamin C, and folate content. Okra is also known for being high in antioxidants. Okra is a good source of calcium and potassium and can be fed raw or cooked. Its leaves are also edible. Onion (other veg) – Onion should be fed in moderation as too much raw can upset the stomach, however it has good health benefits being good for the immune system and heart. It is often more palatable cooked than raw. ​Pak choi / bok choy (leafy greens) – This is one of the better leafy greens, having similar properties to Kale and Dandelion but sometimes being preferred as it has a less bitter taste. It has good amounts of copper, calcium and a good calcium/phosphorus balance so is especially useful for growing youngsters. Papaya (fruit) – This is a fruit that is relatively high in sugar, often sold dried and fresh. This should only be fed in moderation due to the sugar content, dried in particular is high. Parsnips (other veg) – This is a good source of carbohydrates and can be fed raw or cooked but it is generally preferred cooked. As it is rich in carbohydrates it is best kept for occasional meals or for when you need to bulk a rat up. Parsley (leafy green – herb) – This is a useful leafy veg full of herby flavours. It is can also act as an appetite stimulant where an animal is reluctant to eat. Some rats dislike it for its bitter flavour. Passion fruit (fruit) – This is a fruit that is relatively high in sugar. This should only be fed in moderation due to the sugar content. Peach (fruit) – These are popular fruits with rats and can be fed raw or cooked though they are relatively high in sugar so should be limited to occasional treats. If feeding them you should either remove the stones before offering them, or monitor the rats and remove the stones once they have eaten the flesh as the stones do contain arsenic though at relatively low levels. Peas (legume) – can be eaten raw or cooked, shoots or leaves from the plant can also be palatable. Frozen peas are particularly useful as they can be fed still frozen which is an advantage in warm weather. Try throwing a handful frozen in a shallow bowl of water for pea fishing. Pineapple (fruit) – This is a fruit that is relatively high in sugar, often sold dried and fresh. This should only be fed in moderation due to the sugar content, dried in particular has a very high sugar content. Plums (fruit) – These are popular fruits with rats and can be fed raw or cooked though they are relatively high in sugar so should be limited to occasional treats. If feeding them you should either remove the stones before offering them, or monitor the rats and remove the stones once they have eaten the flesh as the stones do contain arsenic though at relatively low levels. Pomegranate (fruit) – These are high in vitamin C and antioxidants so great for long term health and wellbeing. They can be fed raw or cooked and are very palatable to most rats. Pomelo (fruit – citrus) – As with all citrus fruits this is a good source of vitamin C but contains high levels of De limonene (especially in the skin and pith) so should be only fed to does. It may reduce the chances of certain cancers but is high in sugar so should be limited to occasional treats. Potato (other veg) – Potato is more of a starchy carbohydrate source than a veg and as such shouldn’t be fed very often unless you are trying to bulk up a rat. Whilst they can be fed in small amount raw you need to avoid green potato and generally they are better fed cooked. Potato peelings can be fed (ideally cooked) but bear in mind that much of the chemicals used in the growing process will end up in the peelings so this is better done from organic or home grown spuds. Prunes (fruit) – Prunes are dried plums, they are often served in syrup and these should be avoided, aim for those tinned in fruit juice and don’t feed too often due to the sugar content. There high fibre content can make them quite useful on occasion. Pumpkin (other veg) – Pumpkin is a member of the squash family and is high fibre. This makes it particularly useful when a rat has diahorria such as when on antibiotics. It can be fed raw and cooked though some rats dislike it raw, you may also be able to find canned pumpkin which is useful to have on hand in case of stomach upsets. ​Radish (other veg) – Radishes can be fed alongside their leaves (and being easy to grow this is quite nice to do), they can be a bit spicy for some rats but most like them well. Raisins (fruit) – As with any other dried fruit these are high in sugar so should be fed sparingly. Otherwise are fine to feed. They are high in fibre and do seem to have the effect of giving very smelly rat wind. Raspberries (berry) – Raspberries are full of vitamin C and antioxidants so great for long term health and wellbeing. These are also lower sugar content than most fruits so are better for their teeth and waistline. The can be fed raw or cooked. Just look out for the skin and staining that can be left behind as it may make you think there has been murder. Redcurrant (berry) – Redcurrants are full of vitamin C and antioxidants so great for long term health and wellbeing. These are also lower sugar content than most fruits so are better for their teeth and waistline. The can be fed raw or cooked though some rats find raw a little bitter. Just look out for the skin and staining that can be left behind as it may make you think there has been murder. Red cabbage (other veg) – This can be fed in small amounts raw though is more palatable cooked. It is not as useful as the green variant and can cause stomach upsets if too much is fed raw. Red onion (other veg) – Onion should be fed in moderation as too much raw can upset the stomach, however it has good health benefits being good for the immune system and heart. It is often more palatable cooked than raw. Rhubarb (fruit) – As with humans Rhubarb should only be eaten when cooked. It should also be limited to an occasional treat only and kept in small amounts due to antinutrients found in it. Rocket (leafy greens) – This is a useful alternative to dandelion and kale. It is full of iron, calcium and vitamin K.
Runner bean (legume) – These should be fed cooked, in dried form they may contain antinutrients harmful to the rats. ​Savoy cabbage (leafy greens) – This is a useful alternative to dandelion and kale and is a very good rat veg suitable to be fed daily. It is full of iron, calcium and vitamin K.
Shallot (other veg) – This is a member of the onion family and should be fed in moderation as too much raw can upset the stomach, however it has good health benefits being good for the immune system and heart. It is often more palatable cooked than raw. Spring greens (leafy greens) – Also known as spring cabbage or fresh greens, this is a useful alternative to dandelion and kale and is a very good rat veg suitable to be fed daily. It is full of iron, calcium and vitamin K.
Spring onion (other veg) – Rats will generally prefer this chopped up in things and may dislike raw strong spring onions if they are a bit nippy. Keep to occasional (e.g. once a week) as with members of the onion family they cause issues in large amounts but are good for rats in smaller amounts. Spinach (leafy greens) – This is a high oxalate greens (which means high in vitamin A, which can be overdosed in rats) so should be kept to once a week maximum in small amounts. Squashes (other veg) – It is high in fibre which makes it particularly useful when a rat has diahorria such as when on antibiotics. It can be fed raw and cooked though some rats dislike it raw. Strawberries (berry) – Strawberries are full of vitamin C and antioxidants so great for long term health and wellbeing. These are also lower sugar content than most fruits so are better for their teeth and waistline. The can be fed raw or cooked. Just look out for the skin and staining that can be left behind as it may make you think there has been murder. Swede (other veg) – This is a good source of carbohydrates and can be fed raw or cooked but it is generally preferred cooked. As it is rich in carbohydrates it is best kept for occasional meals or for when you need to bulk a rat up. Sweet chestnuts (other veg) – this is more palatable cooked and may cause digestive upset if fed raw. It is also high in carbohydrates so should be kept to an occasional treat. Sweet corn (other veg) – Very palatable to rats both in cooked and raw form, High in sugar though so should be kept to an occasional treat. This can also be fed whilst still on the cob and in its leaf wrappings for extra challenge. Sweet peppers (colourful veg) – Peppers are high in vitamin C and much appreciated by rats. The whole pepper (including seeds) can be offered to the rats both raw and cooked. Avoid very spicy variants of the related chilli family. Sweet potato (other veg) – This is a good source of carbohydrates and can be fed raw or cooked but it is generally preferred cooked. As it is rich in carbohydrates it is best kept for occasional meals or for when you need to bulk a rat up. Sugar snap pea (legume) – As with most peas this is very popular both raw and cooked. Try threading some on a bit of string to add to the challenge. Swiss chard (leafy greens) – This is a high oxalate green so should be kept to small amounts once a week. Rats useually enjoy both in raw and cooked form. ​Tangerine (fruit – citrus) – a nice source of vitamin C, should only be fed to girls and limited to once a week in terms of sugar content. Is well loved raw and even in the skin. Tomato (colourful veg) – Full of vitamin c and generally well enjoyed by most rats, you can feed this cooked and raw. Rats particularly seem to enjoy the baby version. Avoid feeding the plant it grows on, leaves and flowers. Turnip (other veg) – This is a good source of carbohydrates and can be fed raw or cooked but it is generally preferred cooked. As it is rich in carbohydrates it is best kept for occasional meals or for when you need to bulk a rat up. ​Water chestnuts (other veg) – Very popular with rats, this is a starchy food so should be kept to smaller quantities as an occasional treat. Watercress (leafy greens) – Rich in iron and vitamins this is best kept in smaller amounts but can be fed raw. Watermelon (fruit) – This is a great moisture source for shows and hot weather, try freezing cubes for ratty ice lollies. ​Zucchini / Courgette (other veg) – Good to feed cooked or raw, often especially appreciated grated.